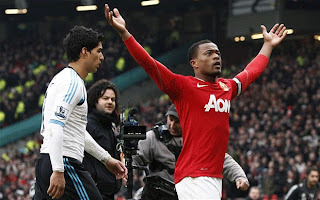 Man Utd - Liverpool was always going to be the clash of the most successful clubs in the league with alot of history behind them but what was unfortunate to see as a football fan was the continuation of bad behaviour of some one called Luis Suarez. Firstly the racist comments on Evra for which Suarez was rightfully banned for 8 matches which should have taught him a lesson or two.But it wasn't the case and we had to see the scenes before,during and after the game. In case you missed it, im sure you would want to see it for your self what went on in the Man Utd - Liverpool game. Its a shame for anyone to be playing this game at the very top league in the world and Alex rightfully did go on to call him a disgrace for Liverpool Football Club. The Liverpool owners have also gone on to state that Suarez let them down and didnt live up to what was expected out of him. Suarez has apologised for his behaviour , through Liverpool's official website and hopefully will want to get on with the game. Im sure the video is self explanatory.